The appropriately named "Tom Thumb" was the first success steam locomotive designed in the United States, created by Peter Cooper during the summer of 1830 (steam locomotives shipped from England began operating in America just a few months after the locomotive was tested). It is without question the most recognized locomotive ever built (in the U.S.), which interestingly enough because of only being an experiment was built mostly with cobbled together parts found here and there. While some of its legend has never been fully documented on paper there is no question that it ushered in a new era for the railroad industry where no longer would true horse power pull trains but instead the artificial variety, found within the mechanical iron horse. 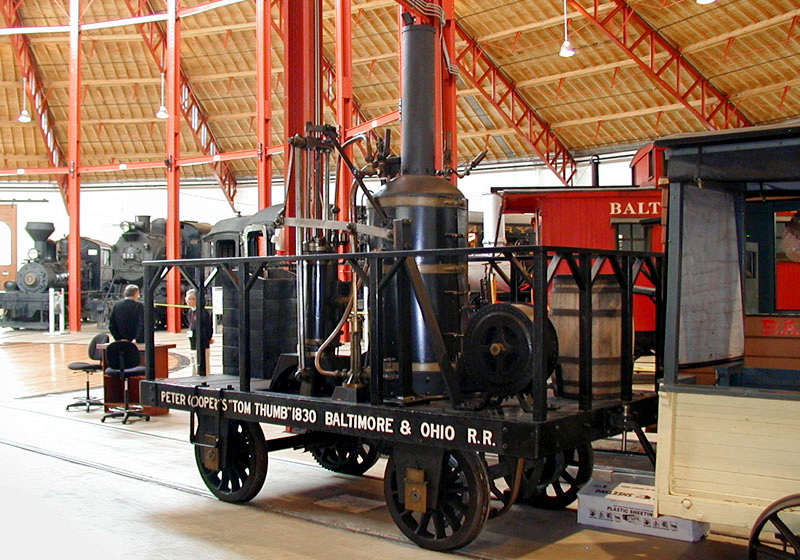 Unfortunately, the original "Tom Thumb" was not saved for posterity's sake (as seemingly few experimental designs of any kind are) but a replica built during the early 20th century is preserved, and operational, at the Baltimore & Ohio Railroad Museum. 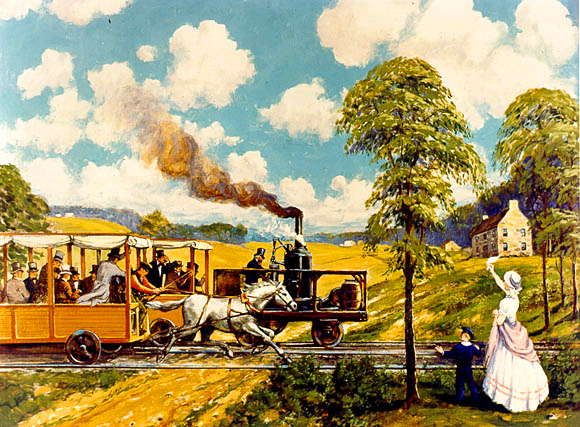 The Baltimore & Ohio Railroad officially began construction on February 4, 1828 since Independence Day was the preferred date to begin building a new transportation project, which in those days had always been waterway canals. Grading began late that year and into 1829. By the following year, January 1830, the B&O had about a 1.5-mile segment of standard-gauge track (4 feet, 8 1/2 inches) open for business west of Baltimore. This had quickly accelerated by that May when the railroad had finished a 13-mile route to Ellicott Mills (today known as Ellicott City) where it constructed today's oldest still-standing depot. By that summer the B&O was hauling small consists of passengers and freight along its main line (Ellicott Mills, for instance, offered freight business in the form of general local business like farm products as well as a granite quarry, known as Ellicott's quarries). During its first eight months or so of operations the B&O, and most other rail lines in use at the time, relied almost solely on horse or mule power to move traffic. However, in August a man by the name of Peter Cooper approached B&O officials stating that he had built a small steam locomotive that he wished to test on the railroad's tracks. 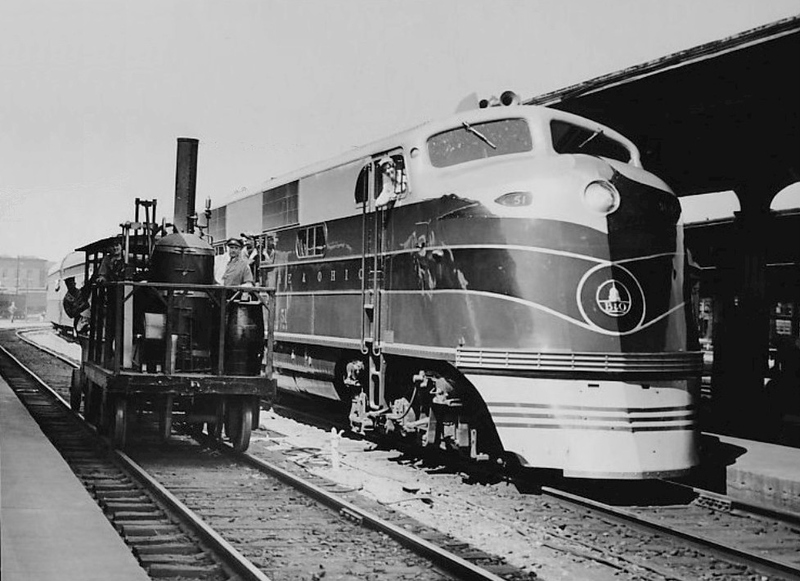 By trade Cooper was a businessman but also an inventor and he hoped to convince the B&O, and the new industry itself, that American-built mechanical steam-driven locomotives would be the future power of choice to move freight and passengers. Of course, steam locomotives were nothing new even by 1830 as Richard Trevithick of England was the first to successfully develop such when he showcased his initial design on February 21, 1804.
Cooper had been designing his locomotive since 1829 and unlike with Trevithick's and George Stephenson's models (the latter also being from Britain), which both were built using a horizontal boiler, he came up with a vertical design. The locomotive's cylinders were likewise placed on the platform vertically, beside the boiler, and used a geared-drive that powered only one of the two axles. It really resembled nothing like later steam locomotive models from its appearance to mechanical operation (such as no horizontal boiler and lack of rods, among other things). Peter Cooper may have designed what became known as the "Tom Thumb" but its construction was thanks to the workshop of George W. Johnson, and his apprentice James Millholland who later went on to design and engineer numerous steam locomotives. From a wheel arrangement standpoint, officially known as the “Whyte notation” (developed by Frederick Whyte), which classifies steam locomotives by front pilot truck, drivers, and trailing truck the "Tom Thumb" was a 2-2-0 Planet type. For instance, how the system works is by counting the number of leading wheels (those found on the front of the locomotive or pilot), then the number of driving wheels (those found directly under the boiler), and finally the number of trailing wheels (those found under the locomotive's cab), all separated by dashes. The locomotive weighed less than a ton, which is how it gained its nickname as the "Tom Thumb". Its overall dimensions were roughly 13 feet, 2 3/4 inches wide and 12 feet, 9 inches high (to the top of the boiler's stack). Cooper had it designed to burn standard coal as fuel source (anthracite, specifically). After Cooper convinced B&O officials to test his locomotive the date of August 28, 1830 was set for the trial run near Baltimore and the "Tom Thumb" would carry B&O's directors. It was also decided to have a traditional horse-powered train of passengers race the little steamer to see just how effective it was in service. As legend goes, when the race began the "Tom Thumb" rather quickly began outpacing its live counterpart and was able to achieve a top speed of between 10 to 15 mph. 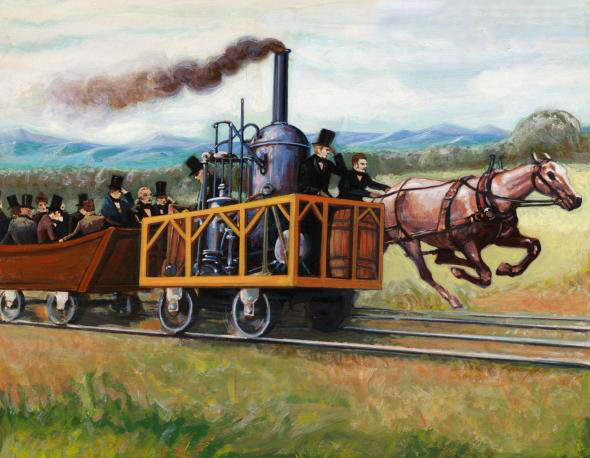 However, during the race the locomotive's blower belt came off the pulley, which caused it to lose its steam pressure eventually allowing the horse to catch up, pass, and win the contest. Despite the setback B&O officials were extremely impressed and realized the incredible advantages steam power offered. After the race the locomotive took railroad dignitaries across the entire main line to Ellicott Mills and back. It went on to operate in non-revenue service capacities for the B&O for nearly a year until around March, 1831. During that time it was continually tested in terms of determining how to properly, and somewhat safely (the term is used lightly), operate steam power. Unfortunately, since neither Peter Cooper nor the Baltimore & Ohio hoped to use the "Tom Thumb" in regular service there was never any thought given to saving it for historical purposes. Additionally, if Cooper had made drawings and diagrams of the design they have also since been lost. In 1834 the locomotive was salvaged for parts and disappeared forever. Four decades later Cooper did make some rough sketches of the "Tom Thumb" when he was given credit for what he had done. It was from these drawings that the then B&O's Railroad Museum had a replica built of the locomotive for its 1927 Fair of the Iron Horse. Interestingly, this version of it is far heavier, larger, wider, and taller than the original so that it could function more reliably during the fair.